Tuesday, December 1 at 2 p.m.
Yumi Hwang-Williams, concertmaster and Bil Jackson, principal clarinet, with pianist Sue Grace. Sunday, Nov 29 · 2:30 p.m.
Master Percussionists of the CSOMake sure you tune in to Colorado Public Radio November 30-December 2 to catch this one-time only, three-day on-air fund drive, which features CSO musicians giving live studio performances and talking about the orchestra, as well as prominent CSO leaders sharing many of the exciting plans for this season. At 2 p.m. on December 1, concertmaster Yumi Hwang-Williams and principal clarinet Bil Jackson will perform live from the studio, and violinist Larisa Fesmire and violist Catherine Beeson will perform live from the studio on December 2 at 2 p.m. New principal cellist Silver Ainomäe will also perform live from the studio on November 30 at 10 a.m.
What Christmas CD are you playing? Subscribe to Interchanging Idioms and post a comment and you would win this fabulous CD featuring the amazing Yo-Yo MaThis is your chance to get this wonderful holiday album completely free, and in time for the holidays. The contest will end December 1st so SUBSCRIBE today!The contest rules are simple. 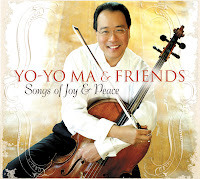 Once you have subscribed to Interchanging Idioms, find a post featuring Yo-Yo Ma and post a comment. Send me an email with your Name and Address AND the text of your comment so I can verify you are the person making the comment. (I need your name and address so I know where to send the CD if you win). IF you just can't wait for the CD you can purchase it online at iTunes or at Amazon. Either way, don't miss out on the Classical Holiday CD for 2009. Sting: "If On a Winter's Night"